What’s Next For Andy Carroll? Brendan Rodgers is one of an ever-increasing number of football managers devoted to the mystical Barcelona Way, the aesthetically pleasing football method that, after a couple of years of obscurity, suddenly popped into our collective consciousness in 2008. The Barcelona Way got Rodgers where he is now. Without the inspiration of Cruyff, Guardiola and company, he would never have succeeded in teaching a Swansea team composed of honest, lower-league professionals to “play football the right way.” And had Swansea employed traditional kick-and-run tactics, they would probably have been relegated. And had they been relegated, Rodgers almost certainly wouldn’t have been hired by Liverpool. It’s a bummer for Andy Carroll that Barcelona exist. The really frustrating thing about Andy Carroll is that he fooled us all. That six-foot something bludgeon of a center forward, that Anfield flop, that money-grubbing drunk: he had us. All of us. When he scored ten goals during the first half of the 2010/11 Premier League season, when he routinely scared the bejesus out of real-life European defenders, we all thought he was good. Not just good; good. Future-of-English-football good. Gonna-bring-home-the-2018-World-Cup good. These days, the best you can say about Carroll is that he probably didn’t do it on purpose. No footballer can control tabloid hype. Carroll didn’t decide to have his potential international future elevated from “maybe decent” to “certainly brilliant,” The Sun decided for him. Even in his glory moment – and moment is certainly the right word — Carroll probably knew that the press was only praising him to the heavens in preparation for a precipitous trip back down. 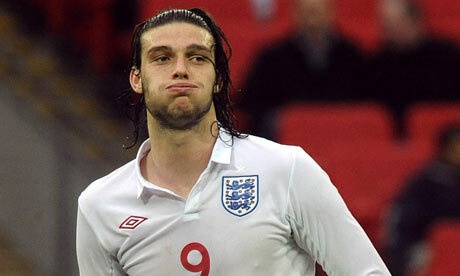 At the time of writing, Andy Carroll plays for Liverpool — not the Liverpool of 2005, nor the LIVERPOOL! of the 1980s, but today’s disillusioned, downtrodden, Europa League liverpool. Since signing in January 2011, a combination of injury, bad luck and unbelievable goal droughts have stopped Carroll from achieving, well, anything. It took him until March to make his debut and even longer to score his first goal, which came, surprisingly, from a long-distance strike. Last season, Carroll struggled to establish himself in the starting lineup, let alone score. His best moment, a winner against Everton in an intense FA Cup semi-final, was ultimately futile — Chelsea beat liverpool in the final. The rough, intimidating Carroll seems like the kind of guy who would seriously consider doing you bodily harm if he didn’t fear an inevitable newspaper reprisal. Perhaps that’s symptomatic of his recent fall from grace, or perhaps he just thinks you’re not worth the trouble. Carroll is muscular and potentially violent, but he’s also surprisingly nimble. When challenging for headers, he seems to hover for longer than gravity permits, thereby outfoxing Premier League defenders and Isaac Newton. Those strengths contend with the pronounced sadness lurking in the crevices of his stony Northern face. Even at the best of times, he’s not a player who inspires confidence. He sometimes wears a ponytail, for crying out loud. Even if he’s not actually an actually an alcoholic, his face pops into your head every time you hear the word. Now more than ever, Carroll seems wary, even frightened. He looks about one corrosive tabloid editorial away from complete implosion. Carroll’s immaturity makes him hard to like, but it’s impossible not to feel sorry for him: every big-time player experiences the press rollercoaster at some point, but few experience all of its ups, downs and loops within 18 months. After a year of catastrophe, along with a few highlights (late-season improvement, goal against Sweden, etc. ), Carroll begins a new era at liverpool fc: the Rodgers era, the introduction and gradual implementation of the Barcelona Way. Only, Andy’s not wanted anymore. Rodgers admits that Carroll is a “good kid,” but when talk of a potential loan deal came up in a recent press conference, he seemed less than convinced of the Englishman’s value: “It’s something I would have to look at, I have to be honest… He knows exactly where he stands.” Rodgers went on to say that liverpool haven’t received any offers for Carroll (INFTH Interpretation: Please, fellow teams, give us money for tall English player!) but that a deal might benefit the club long-term. Who knows? They might even get their capital L back. Carroll should be the quintessential modern player. Much like Cristiano Ronaldo, he can play 90 minutes of football and still look as if he just got out of the shower, despite the evidence of dirt stains and muddy knees. Maybe it’s the hair. But Carroll is a member of a dying breed, and, as such, he’s unlikely to succeed at any of Europe’s major clubs. The traditional, up-and-at-em’ number nine is pretty much obsolete. Indeed, it’s only a matter of time until all strikers are obsolete. Newspaper speculation has Carroll joining every team from AC Milan to Stoke City. He could be partnering Zlatan next season. Or Cameron Jerome. But, you see, that’s part of Carroll’s mystique. He could be terribly brilliant, or he could just be plain terrible. No one really knows what’s next. Enjoyed this. Especially the stony Northern crevice sad face bit.